With the motto of helping the industry to grow further ABC Infra provides the best over-size heavy construction equipment like Crane rental services, Boom-Lift / Man-Lift, Cherry Picker, Scissor Lift, Truck Mounted Boom Lift, Aerial Work Platforms, Aerial access Platforms, Spider Lift of various height as per client’s requirement in India to the various project executing companies. The main aim of any business is to accumulate more and number of happy customers. ABC Infra Equipment PVT. LTD. company lives up to the expectation and provides its customers with a timely and cost-effective crane on rental service. Our Major Locations in India are Mumbai, Chakan (Pune), Chennai, Bangalore, Hyderabad, Dahej, Ahmedabad, Ambernath, Aurangabad, Bharuch, Vadodara, Nagpur, Bhopal, Indore, Raipur, Cuttack, Angul, TADA, Jamshedpur, Tamil Nadu, Sanand, Hazira, Surat, Taloza, Padgha, Paradip etc. where we are providing crane, boom lift & scissor lift, skid steer loader on rental services. With the increase in projects in the oil & gas industry, petrochemical industry, energy sector, construction and infrastructure, the need for certain good quality construction equipment has increased by leaps and bounds. Not all companies are equipped to help customers with diverse professional Crane & Boom lift rental service. ABC Infra Equipment PVT LTD. is that leading company that surfaces in this context on a regular basis. ABC Infra continues to serve the industry with the superior most variety in terms of the heavy equipment and lifting machines on offer and also generates the awareness for the crawler crane, hydraulic telescopic crane, mobile crane services & boom scissor lift services through its blog section. This saves builders from investing a huge sum of money on buying new or additional machinery that can cut them back on the supply of finances for other more important aspects in the project. With supplies and services such as the Crane, Boom lift & Scissor lift rental, the company has come to a position where it controls a massive percentage of the logistics and construction heavy lifts management in the industry over India. We can now proudly boast to have worked with the best in the industry and having the opportunity to have catered to various industries like Engineering, Oil & Gas, Power, Refineries, Chemicals, Cement, and Shipyards etc. 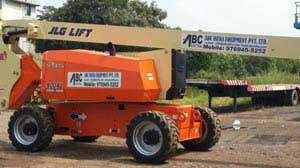 I would recommend ABC INFRA for all of your lifting & access equipment needs. They are customer and quality focused and very responsive to changing needs. I have found them to be cost competitive, timely and willing to work with you to accomplish project goals. I call ABC INFRA first when I need a crane or aerial work platform. I feel that the prices they quote are very competitive and make my bids for tenders very attractive. They are always accommodating to fit my schedule even when there is very little advance notice. To race through this competition and to have "Happy Customers", all you need is someone who will ensure efficient, cost effective and timely transport & logistics services. Mumbai, Chakan (Pune), Chennai, Bangalore, Hyderabad, Dahej, Ahmedabad, Aurangabad, Bharuch, Vadodara, Nagpur, Bhopal, Indore, Raipur, Cuttack, Angul, TADA, Tamil Nadu, Sanand, Hazira, Surat, etc.